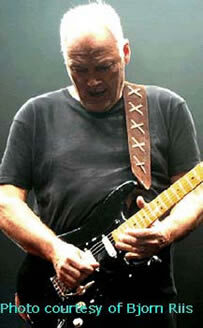 The guitar strap that David Gilmour wears was once owned by Jimi Hendrix. David's wife bought it for him at a Sotheby's Auction several years ago. David actually wears the strap backwards from the way Jimi wore it (please check out our Custom Gilmour Guitar Strap and Jimi Hendrix Guitar Strap pages for more info and photos). This strap is made from two layers of sueded leather and laced with light beige suede lacings. We add our signature buckle for adjustability. To make sure you order the right size, lay your current strap flat and measure from the center of one peghole to the center of the other peghole. As with all of our products, quality is our top priority! The Modified Gilmour guitar strap looks just like the guitar strap you see David Gilmour wear from the front, but the back does not look the same (meaning the strap as it lays on your back). We also make an exact replica of the original strap, but since David wears it backwards from the way Jimi did, this version is a beautiful, high quality replica you can't go wrong with, and the price is more than reasonable! We have sold countless Gilmour Replica straps over the past decade and a half and have never, no kidding, never ever had even one returned! Special thanks to Charles R. Gray and Bjorn Riis for their indispensable help with the creation of this replica!